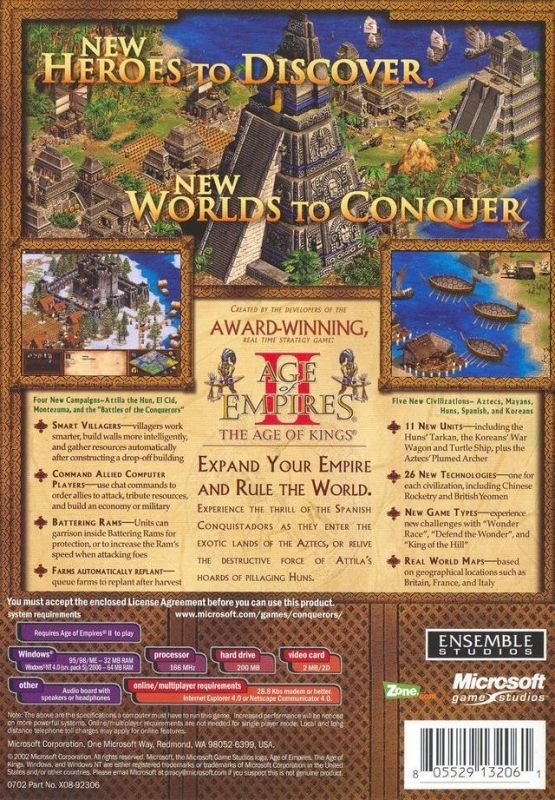 Age of Empires II: The Conquerors Expansion brings 5 new civilisations in the AoE world, among them, Mayas and Aztecs. New technologies, new combat units and unique gameplay with the Aztecs and Mayas (no horse), new campaigns made their appearance. 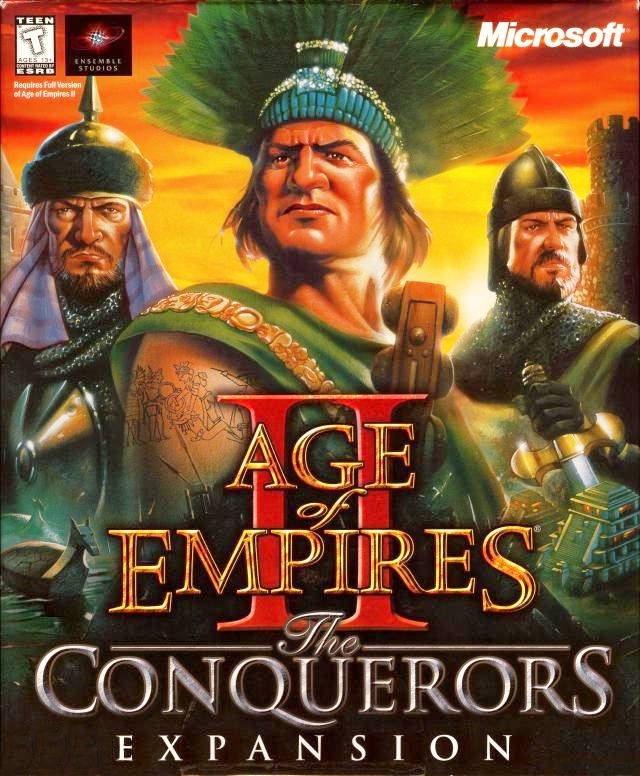 The Conquerors is the add-on of the real-time strategy game Age of Empires II: Age of Kings, still developed by Ensemble Studios and published by Microsoft Games Studio. 11 new units like Turtle Boat or Hussar Calvary unit without forgetting the unique unit for the new civilizations: Aztec Jaguar Man, Mayan Plumed Archer, Spanish Conquistador and Hun Tarkan. 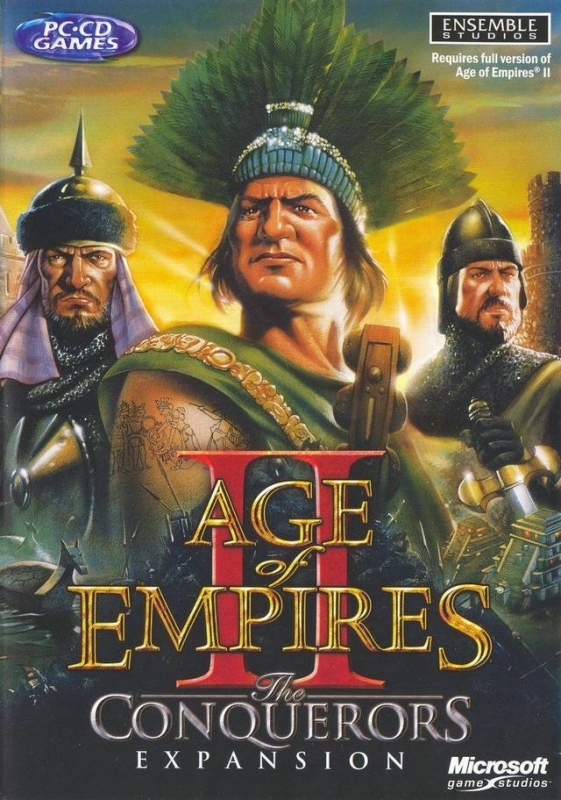 Full version of Age of Empires II: The Age of Kings. Multimedia PC with Pentium 166MHz or higher processor. 100 MB of hard disk space for a typical install (in addition to the original Age of Empires II required disk space); additional 100 MB of hard disk space for swap file. Super VGA monitor supporting 800x600 resolution. Local bus video card that supports 800x600, 256 color resolution and 2 MB of VRAM. 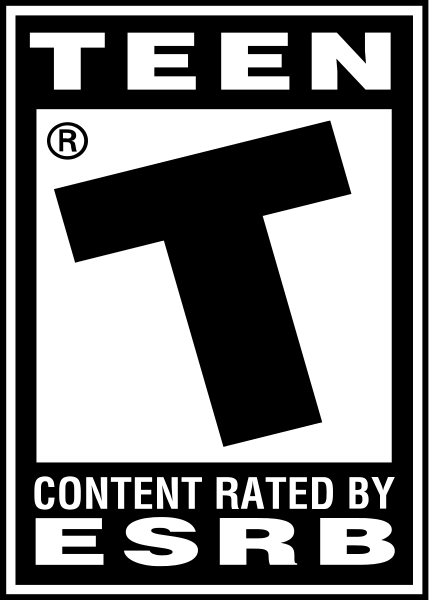 28.8Kbps modem (or higher recommended) for internet or head-to-head play. Internet access required for internet play. Favorite RTS of all time. The best RTS expansion ever made.